The great glyph rush (aka Glyphmas) is still on the massive changes to the glyph system are still being discovered by the mass of players and this weekend will only add more people wanting more glyphs than ever before as the weekend warriors come out to play. My time and gold investment pre 4.0.1 paid dividends, not as much as I hoped but I believe my need to work and my greed prevented me from capitalising more than I did but with the second wave incoming I am hoping to get it right this time. My strategy was simple enough take 1 maxed out scribe, give him 5000 gold and in the 2 weeks leading to the patch buy all Northrend herbs costing under 75s each (or 15g per stack), mill them and turn them into inks and make 20 of each glyph until I had either run out of gold or bag slots. I have 6x Pack of Endless Pockets and the 16 slot back pack free (stupid paladins and their many gear sets taking up way too much space). 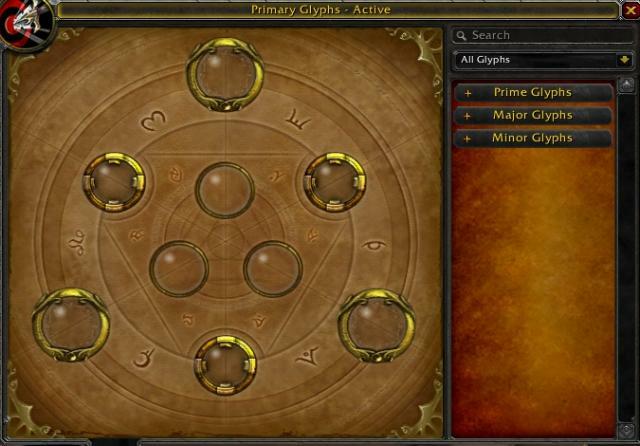 During this 2 week period I had been selling a few glyphs of each at normal server price, which averages out at 5g an OK return on gold investment but the time required means I had been right to ignore the glyph industry on Shadowsong EU previously. On Tuesday (4.0.1 patch day here in the EU) I was able to repay the 5000g investment to my bank toon have 500g left and 2800 glyphs ready for posting. As my scribe had started with around almost nothing, this meant that whatever I make from these glyphs is pure profit, so with server shut-down due in 1 hour I started to post the glyphs on the AH at market value or 97g if the market value was under 40g. Thanks to the wonder of the Quick Auctions 3 I was able to get these posted automatically with 5 minutes to spare before shut-down. This timing was a gamble, I was going to waste much of the posting time in the extended maintenance but having to work for a living means that I was not likely to be home when the servers cam back up and I wanted a piece of the action. The gamble paid off as while I was posting a few glyphs sold as people wise to the impending glyph changes where snapping up glyphs before they hit silly prices and I managed to sell 15 glyphs that netted me 1200g. I was now very excited about what would follow. Logging on after the massive download I was disappointed to see only 20 more sales that brought in another 1000g, a look at the AH showed that my early posting had backfired as all my 97g glyphs were the highest priced glyphs and I had been massively undercut. I gambled again that the competition would dry up and rather than cancelling and reposting left all the glyphs up. The following 24 hours netted sales totalling approx 5000g giving a total of 7200g, not bad but I feel I could have made more by posting 5 of each initially (not 20) and then posting in batches of 5 as I was able to log in. Last night I have reposted 5 of each glyph lowered the threshold from 40g to 25g and so far today I have sales of 4000g, seems the market likes my prices much more and/or the competition are running out. In review I would have to say I was happy at the returns approx 11500g and still over 2000 glyphs left to sell and I am hoping to average 30g each for these so a bumper payday could still be in my future.